It was fifty years ago today- October 6, 1968 World Series Game 4 at Tiger Stadium, Detroit, Michigan. A pitchers duel was expected when the two most dominating pitchers in a year of great pitchers faced each other- Bob Gibson and his 1.12 season ERA and Denny McLain and his 31 wins but it turned out to be a Cardinal blow out. Bob Gibson lived up to his end of the bargain pitching a complete game striking out 10 and giving up only 1 run on 5 hits. McLain, meanwhile had his second subpar performance in the series being removed with 2 outs in the top of the third giving up 3 earned runs and 6 hits. 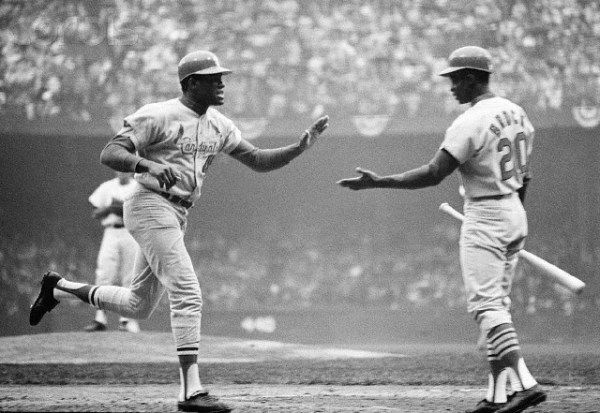 For the Red Birds Lou Brock hit his second home run of the series and was 3 for 5 with 4 RBI’s and pitcher Bob Gibson also hit a home run- Tiger pitcher Mickey Lolich had hit a home run in game 2. Catcher Tim McCarver continued his hot series going 3 for 5 with an RBI and Mike Shannon was 2 for 5 with 3 RBI. The only Tigers run came on a 4th inning home run by Jim Northrup. The Cardinals pounded out 13 hits in a 10-1 blow out- scoring 2 in the first, 2 in the 3rd, 3 in the 4th and 4 in the 8th- to take a 3 games to 1 lead over the American League champions- all they would have to do now is win one more game- the Tigers would need to win three in a row- and only two teams have came from being down 3 games to 1 in the World Series to win- the 1925 Pirates and 1958 Yankees. Game 5 would be Monday afternoon at Tiger Stadium with Nellie Briles trying to close the series for the Cardinals against Mickey Lolich who was brilliant in Game 2 going for the Tigers.